GMail, seems to have opened the floodgates for email storage. And while it is still in its beta stage, quite a few other free email providers are threatening to take away the crucial popular advantage that GMail seems to offer. We will look at the issue in two sections - first we will try to understand the big ado about the 1 GB email service. Then we will look at how this affects GMail. Ever since GMail came with the email for life offer, everyone seems to be falling head over heels in telling everyone that 1 GB of email space is good, and in other words that we all need 1 GB of email storage. Though 1 GB is good, it is like the offer at your favourite restaurant - "Eat all that you can and pay your usual". The problem with such an offer is this - you just cannot eat any more just because it is available. Email users are typically of three types - the desktop user, the home user and the kiosk user. These are non standard terms, more of relevance to this article. The desktop user is a user who does not use the webmail. He has a desktop email client and users a service provider to connect to. We assume that this user is one of the heaviest users of email. The home user connects to the Internet using a personal/dedicated machine and has an alternative disk storage without having the Internet connectivity enabled. This user uses webmail and typically is a lighter user than the desktop user. The kiosk user is user who uses a public machine and a public connection. Such a user does not own any disk space and cannot access any data without having a live Internet connectivity. Lets look at how long it takes each of these users to rake up 1000 MB or 1 GB on their email accounts. We assume that a desktop user typically adds 1 GB every year to the size of his inbox. Taking into account that the usage might not be dedicated and to err on the conservative side, this is about 400 kb every hour. We assume that a home user is half as active in using email and a kiosk is one-fourth as active. This means that a home user takes 4.5 years to rake up a GB while a kiosk user takes 16 years to make 1 GB. Assuming a 1:3 split between the Home user and the Kiosk user, we have, on an average 13.2 years for users to hit their 1 GB mark. A lot of things can happen during this time. More importantly this means that the webmail provider only has to increase his inbox size only up to 75 MB per subscriber and need not gear up to 1000 MB anytime in the near future. In short this means that the Gigabyte is not as huge as it is made out to be. The actual usage of it might be a lot lesser than even these numbers suggest. There is hence little that is actually different in the Gigabyte rush. However the only thing that will severely affect these numbers is the usage patterns. Unless GMail becomes the next biggest file sharing network things might change. Again, as long as the bottleneck is the network and not storage, things might not change all that much. It is wonderful how a company makes a difference to a product. For all that dilbert says about companies, which I am sure I almost always agree with, it its own way the company is an indespensable part of getting something done. Yeah, it will always be slower than a motivated individual, but it will always be better than the majority of us randomly spending time who might effectively cancel each other out. And I slowly start to believe that companies actually have a character of their own that rubs of very explicitly on its employees. Just a few days back I was writing to a groups of friends from way back in college. And they commented on how different I think. They asked me if my educations had anything to do with it. No. The company did. Eerie, unacceptable, grossly unappropriate but true. You might be wondering how this ties up to the heading. Well, I was looking through some of the options of blogger and somehow I felt that google was behind some of them. It may be the layout, the style, the wordings I really dont know. And additionally when blogger came out, it gave an awesome set of tools to make your own template. But a majority of us out here dont have the patience nor the expertise to make good templates for ourselves. We would depend to a great extent on templates given by blogger. And check out the awesome set of templates that are available now. I *think* google has something to do with it. I logged into Blogger on the morning of 7th May, to discover a link that proclaimed that I was an 'active' user and invited me to signup for a preview of Google's much awaited block-buster - GMail. Considering this is what I had been waiting for, ever since I heard the first whispers about GMail, I was more than happy to oblige. The signup process was quick and painless. The GMail signup wizard picked up my name and email from Blogger, and brought me to a page that asked me to simply choose a account name. The text box that asked me to choose an account name, had a helpful little button right underneath that said "Check Availability", to check if the particular account name was valid and available. Just the signup process showed how professional Google was going to be about GMail. Soon, I was done with the registration and was dropped into my new GMail interface. The first thing that struck one, was the simplicity and cleanliness of the interface. A big friendly GMail logo and the omnipresent Search bar on the top. There was no toolbar cluttered with options, just a drop-down and a single button. The left hand side had just 7 links. The actual section where the mails are listed had just four columns without any headings. The entire interface was designed to be clean and simple, to the point of being austere. The single biggest difference between GMail and other email interfaces is simply this - GMail does not deal with emails. Instead it deals with conversations. A conversation for GMail is the entire set of related emails, including RE:'s and FW:'s. Any display of emails, displays not the actual emails, but entire conversations. The number of emails in a particular conversation is displayed in a bracket. Further, the conversations are ordered by the time of the latest mail in that particular conversation. For GMail, there is one means for classification - labels. Labels are defined by the user and each conversation can be 'applied' any number of labels. These labels can then be used to filter any display showing just that mails that you need to see. There are no folders, where mails can get lost, only filters that can be removed and reapplied with a single click. So much so, even the search is just another filter on the entire listing of conversations. The only 'folder' that is hard coded is the "Archive" option, which effectively removes the mail from the inbox view. Another filtering/flagging option available is the "Starred" option, which visually distinguishes the various conversations. Starred option however extends to individual mails as well, meaning that individual mails in a conversation can also be starred. The actual interface showing the mails in a conversation is unfamiliar but once you get used to it, is very powerful. Each mail in the conversation is shown in a separate 'pane'. These panes are ordered linearly by time. Luckily GMail has refused to show the conversation in either a threaded or nested format, which increases simplicity and correspondingly accuracy. The difference between the 'pane' and a mail is that a pane automagically removes all the quoted part of a mail. That means, in a conversation, the 10th mail usually contains the quoted text from the 9 previous mails. The pane however hides this to show only the content from the 10th mail. Of course, it is possible to show the quoted content too if desired. Drop into a relatively heavy conversation and you will see all the panes tightly stacked together. One click and this opens up into a looser stack, showing just the sender and the time for each pane. Each item can then be clicked to open, read and clicked again to send back into the stack. Every person you mail to, or get a mail from is automatically in your contact list. How absolutely brilliantly simple and obvious. Why ever were we required to use divining capabilities to predict which of the contacts we are dealing with would be needed by us in the future? Of course, with 1 GB of space, you can afford this extravagance. Right now, though, the only contact information you can include is the Name, email and some Notes. I am not sure if I will not miss having fields for at least phone numbers. Another thing, as the owner you are automatically given a nickname 'me'. Click on compose and you will be taken to a page with three text boxes and three buttons. Again, GMail's fanatic focus on simplicity shows. But true brilliance hits you when you start typing addresses in the "To" box. GMail's auto complete feature gets typing addresses back in fashion. If you were not impressed enough, hit the 'undock' icon on the right top corner of the compose screen and the entire compose screen pops right off the browser into a new window. Remember all of you who like to compose in a new window, while browsing messages in another? Well, GMail knows exactly what you are talking about. The spell checking is another beautiful feature. GMail does a damn quick job of marking out all your mistakes in red, allowing you to interactively edit them. However, testing it with an excessive amount of text did produce some unexpected errors. Google extended its "keyboard shortcuts" beta feature to the GMail UI. This means that you can use a number of features without having to reach out for the mouse. This combined with the auto complete feature for filling in addresses is a hark back to the age of the *NIX interfaces, where the keyboard ruled. For those of you who believe in doing things fast, time spent in picking up at least a few of these shortcuts will prove to be a very valuable investment indeed. Those of you who don't give a damn about speed, please please please, just try out the feature once. The sheer genius of the implementation is bound to floor you completely. GMail uses a variety of on-screen prompts to tell you what it is doing. Pages load blazingly fast, and if any one of them takes longer than a second to load, a brief floating message flashes on the top of the page to tell you that the page is "Loading...". While browsing a conversation, a similar floating message flashes on the bottom of the message, telling you whose message is expected next. Another simple yet highly effective trick GMail uses to make life simple for us is to mark out those conversations that are addressed specifically to you, versus those that are part of a mailing list. They call this the "Personal level indicators". Again, an idea that is so dumb, that you wonder why no one else had thought of it before. For most of us, having our email with our_stingy_free_service_provider.com the single biggest reason to defect to GMail would be the 1 GB of email space it offers. For most of us, this would be a life-time supply of email space. This however has not been one of the biggest reasons GMail has been in the news recently. The big controversy surrounds GMails proposal to parse through user email and display relevant ads alongside the message. Compared with yahoo's practice of appending monstrous, irrelevant ads to every email this is hardly an issue. Further, with Google's repeated clarifications that no human would ever access any email information, while only machines would, leaves little reason to be unhappy about. Machines keep reading our mails all the time. Spam filtering software do that. Web based email services do that while displaying messages. List servers (a la yahoogroups) do that when they are munging email headers. Google does not even change the message content, when it parses the mails, but only displays relevant ads alongside the email. Considering Google's stubborn insistence at being honest and open about all it does, I don't see the reason for any controversy. The ads themselves are unobtrusive and plain text ads. And they are placed discreetly to the right, just like in Google searches. If you have searched on Google, and have not been bothered by the sponsored ads, there is no reason for you to even give a second thought to the ads in the google inbox. In fact, considering that for once a company is taking my privacy seriously, and the ads themselves are so cutely non-intrusive, I might be tempted to check a few of them out, just for the heck of it. GMail is an application that has been engineered in the REAL sense of the word. In a world where applications are a lump of collected functionality, GMail outshines almost every application known, let alone email clients. Conversations to store emails, labels instead of folders to classify conversations, keyboard shortcuts, auto complete feature for the addresses are so mind-numbingly essential, that I will start missing them from this second on in my email client. 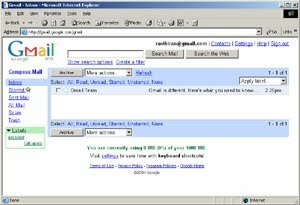 This combined with 1 gig storage, automatically stored contacts and the simple elegance of the UI builds GMail into a formidable package. Those of you who did not get to see it yet - Tough Luck People! May, 07, 2004: First published version. I am sure that it would be very different for someone like me, who has been desperately looking forward to have a dekko at GMail to give anything other than a positive first view of GMail. So I sat over it a full weekend, and I still feel the same about it. So here is my review of GMail. This in fact is one of my first full fledged reviews. - GMail <> Gnu Mail? This is todally wonderful. They actually said that I was an active user of blogger. Wonder how they found that out. Read news that this beta was now being opened for blogger users. Was disappointed when I came here the last time and did not figure out how to do it. Anyways, now that I am in, feels totally wonderful. The first reports of GMail rolling in. Using it for a few minutes, the the single most important feature is the simplicity of the interface - almost austure. No more options to sort by this and that. No more complicated interfaces to to deal with the various sort options you use to view messages by. There are just three elements - the mail, the message group it belongs to and the time it was sent. Period. Nothing else matters. Have exchanged almost 11 mails till now and I have just four items in my inbox. One of that is a set of conversations with 8 different mails in it. So this is their famed feature of message grouping. Also, there is no complicated viewing of the mails possible - grouping order is just based on time and nothing else. Virtually no views of threading are possible as of now. Dont know if that is a good thing or not. Will tell you later. The interface for viewing the grouped conversation is also interesting. More about it in a more structured Beta Report. Will do it over the weekend. Second most important item as far as first looks is concerned. The mail is blindingly fast. As fast as google. Imagine what that is going to do to your view of the Internet. Keep imagining, will get back to it later. As I said - will come back with a full report during the weekend. However the reason I am writing this is to link to my site and increase the number of pages linking to it. Seems www.anarchius.org is not being linked by enough sites for it to be spidered. Will change it. Also keeping track of all that I am doing to get it onto the google index. Will keep you updated on that too. Even a casual follower of technical news would have noticed a recent strengthening trend in mainstream press. There is an ever-increasing mention of terms like Open Source, Free Software, and Linux. Further investigation would reveal that, for some reason, this issue seems to divide the world into two camps: those that feel very strongly about it and those that don’t. That part of humanity, which feels strongly about Open Source Software (OSS) and Free Software (FS), wouldn’t have much use for this article. However, for those of you who are in the other camp and possess a mild curiosity about this phenomenon, this article attempts to unravel a few terms and provide a few perspectives. What exactly is this beast? In the 1970s, the world was still young. At least the world of computers was. The computer then was the Digital PDP-10 and software was something you wrote to get work done. The source code of software was freely available to see, modify, reuse, or improve. The 1980s, however, saw the breakdown of this culture, and the rise of proprietary software. Proprietary software is different from free software. Usage of proprietary is typically limited to usage of the executable only, without access to its source code. The rights of the users to attempt to modify the executable are severely curtailed. Further, compensation is required to be paid to the ‘owner’ of the proprietary software to gain limited rights to use the software. The rights of the customer to reuse or share the software are also curtailed according to the agreement signed for the purchase of the software. On the contrary, free software does not place such restrictions on reuse or sharing of software. Here, free does not mean without compensation, but rather means the freedom to choose to use software without restrictions. Further, the OSS software also distributes the source code of the software along with the executable, so that the user can read and modify it as he sees fit. Returning to the story at hand, this change from the 70s to the 80s was not acceptable to a number of people. One such person was Richard Stallman. He was so irked by the closing up of the software community that he decided to do something about it. To ensure that the freedom to use software remains, he set up the GNU Foundation. The goal of the GNU foundation was to build and distribute components for a complete operating system according to the philosophy of having freedom to use software as seen fit. In 1984, the GNU was set up. In 1985, its first product – the GNU Emacs was built and released to the world. In tune with the philosophy, the GNU baulked at the proposition of “copyrighting” their work. Instead they “copylefted” their software under what came to be known as the GNU Public License (GPL) . Copyleft uses the copyright law, but flips it over to serve the opposite of its usual purpose: instead of a means of privatizing software, it becomes a means of keeping software free. By the 1990s, work was going on in full steam and a number of components of the UNIX system were being rewritten from scratch and released under the GPL. However, for a complete system, there is one crucial component required to tie all of it together – the kernel. The GNU was working on a kernel called the Hurd, but the project was not delivering. And there could not be a complete ‘free’ system without a kernel. In 1991, Linus Torvalds, a 21-year-old computer science student at the University of Helsinki, decided that his personal operating system, Minix, a Unix-look-alike operating system was not good enough. He was pretty sure he could write something better. So in a very brave and foolish attempt he started to write his own. But in doing this he made an important decision, to involve other people. He took the help of a number of the news groups at that time, to ask for ideas and guidance. And from this sprang the kernel, which we now know as Linux. GNU/Linux became the complete “free” operating system that Richard Stallman and a number of others had been dreaming of. No talk about OSS/FS is complete without talking about the other extreme, or at least the perceived extreme – Microsoft. Somewhere along the way, not without reason though, the fight for the freedom to use software has been morphed into the fight between Linus Torvalds and Microsoft (Bill Gates). To the media, of course, this is selling stuff, and it has done little to allay this misconception. However, the first step to understanding, using, and benefiting from OSS/FS starts at breaking the media stereotype of David vs. Goliath. Free software is not about cost. Free software is about freedom, freedom to use, freedom to reuse, freedom to distribute, and freedom to change. If this results in a perceived low initial investment, then it has more to do with the economics of it, rather than it being the USP of free software. Software is like other economic goods and is unlike other economic goods. It is like other economic goods because it needs effort and expertise to produce and serves an economic interest. It is unlike other economic goods as the marginal cost to produce additional copies is negligible. The returns on investment are much, much higher than other economic goods and reusability is much higher than any other investment. This leaves us with a peculiar scenario – an extremely useful economic good and very easy to reuse. This gives rise to problems similar to the ones faced by the music and motion picture industry. But software is not art, and it can deliver monetary benefits. To protect such a ‘property’ the copyright law has been typically employed. Using the principles of IP to protect software like music, has led to a monopoly like situation. Accepting a proprietary software solution for a business process makes the business process monopolistically dependent on the software. And monopoly increases prices, and that too significantly. After the bubble burst on the great IT dream, the software industry is facing a significant over supply of resources, leading to low productivity. And this low productivity is being maintained by the monopolistic premium charged by software vendors. To state it differently – current software development, selling, deploying and administering process is grossly inefficient. This inefficiency is being fuelled by the proprietary nature of software. The bottom line is that the IT department budgets are taking the blame. This is where OSS/FS plays a crucial role. By driving down prices of software, OSS/FS drives true productivity in the entire process of making and selling software. This productivity is what reflects as low prices for OSS/FS and is not an endemic nature of the software. Understand the philosophy of OSS/FS. It is crucial to understand what freedom means because it will help you appreciate the true nature of software in general and free software in particular. Further it will help you no matter where you are to form realistic expectations of what to expect from OSS/FS. If you run the IT department for a business, there is a tremendous cost savings for you. Free software is easier to maintain and gives a lower TCO. Free software contributors are a great source to snag amazing programmers from. Finally free software gives you a flexibility of choice, which is never possible on a proprietary platform. If you are a programmer or a software maintainer, there is tremendous learning for you. You have knowledge beyond your wildest dreams in OSS/FS forums. OSS is a great way to read, obtain and reuse code snippets. FS gives to access to technologies never possible on the proprietary platform. If you are an end user, OSS/FS is your source of productivity and flexibility. Recognize that OSS/FS is not about Windows versus Linux, but is about choice. When you make that investment into hardware or software, recognize that it is your right to demand more. And recognize that your hardware is capable of more, software is capable of more, and proprietary solutions are neither the highest nor the best benchmarks. It is easy to talk about the great dream of free software ruling the earth. However, free software has its own, very obvious flaws. OSS/FS cannot be everywhere. OSS/FS cannot scale to build every need. But is a great way to recognize that software is not just another economic good. You can demand and get more out of your IT buck. And that freedom is your birthright. February, 27, 2004: First published version. This essay was written as a writing sample for an "Effective Business Writing" Course. A history of Microsoft, and why they are the way they are. A few days back I had this discussion with a friend of mine. It centered around one of my favorite topics - Linux and Microsoft. The discussion was essentially about the ideas of monopoly. My friend's view was that being a monopoly, Microsoft was justified in behaving the way it is. My counter-point however was that, this monopoly itself was ill-earned. Which naturally needed a lot more clarification. Hence this article. Microsoft was formed by Bill Gates and Paul Allen, and began by writing software for the IBM's home PC - Altair, around 1975. It struggled the first few years of its existence, looking for its niche in the market. In 1980, IBM was waking up and was like the proverbial cat on the tin roof. IBM wanted to get a machine on the market as soon as possible. And instead of going ahead with another version of their 8-bit machine, they chose to go with the 16-bit Intel, 8086 chip. This meant IBM needed a new OS, and fast. MS DOS was itself not an original product of Microsoft. Instead, it was the creation of a company called Seattle Computer Company, and Tim Paterson (who later joined Microsoft). It was known as QDOS 0.10 (Quick and Dirty Operating System), before Microsoft bought all rights of the OS from Seattle Computer and changed the name to MS-DOS 1.0. IBM never intended that MS DOS (or PC-DOS) be the Operating System for the IBM-PC. They were in fact waiting for the CP/M to come out with its 8086 version. What happened was something quite different. Squabbles between Digital Research (the vendor for CP/M) and IBM delayed the CP/M-86. With Microsoft being the sole interested party in providing an operating system, IBM found itself with a nothing other than QDOS 0.10, under the name of MS-DOS 1.0, for shipping with the IBM PC in October 1981. The quality of this product was so bad that the initial IBM PC shipped without an operating system. Later, IBM itself undertook a rigorous rewrite of the MS DOS, to get it partially ready for bundling with its PC. (The PC-DOS is hence copyrighted by both IBM and Microsoft). In spite of this, Digital Research's CP/M-86 would still have been the operating system for the PC but for two things - Digital Research wanted $495 for CP/M-86 and many software developers found it easier to port existing CP/M software to DOS rather than the new CP/M-86 operating system. Priced at $39.95 DOS became the automatic choice for the users of the new range of IBM PCs. Thus Microsoft's (poor) clone of CP/M managed to become the de-facto Operating system for the IBM PCs, not by any technical superiority, or even a marketing blitz (which Microsoft was quite incapable of undertaking) but by sheer timing. What hap penned to the IBM PC is, as they say, history. Riding on the success of the IBM PC, MS DOS became the default Operating System in the PC world. Despite its success, the MS DOS, was never a technically superior product than any of its contemporaries. MS DOS 1.0 was nothings by QDOS 0.1. It added support for storage disks, and went through versions 2.0 in '83 and 3.0 in 84. Network support did not come until as late as version 3.1 in 1984. While the rest of the world (read Unix) boasted of incredibly powerful and versatile OSes running a variety of hardware platforms, MS DOS was still going with some extremely buggy versions of its operating system, into version 4.0 in 1988. Most of the basic utilities and tools that normally should for part of any operating system were included in versions as late as 5.0 and 6.0 in '91 and '93 respectively. Version 6.22 was released in 1994, which was the last official 'DOS version' of MS-DOS, while 7.0 and 7.1 were released for almost exclusive use as a basis for Windows 95. MS DOS, was never a technical marvel. It's success had more to do with some decisions and some people and the explosion called the IBM PC. But today's Microsoft is not about DOS. It it about quite another thing called Windows. But lets begin at the beginning. The concept of using a graphical visual interface originated in the mid 1970s at the Xerox Palo Alto Research Center (PARC) where a graphical interface was developed for the Xerox Star computer system introduced in April 1981. PARC had earlier also developed a success story with the Alto computer, which in mid 75 were so successful technologically that they quickly became the benchmarks for all graphical interfaces that came later. The Xerox Star did not experience any commercial success, but its ideas were copied by Apple Computer, first in the innovative Lisa in 1983 and then in the Apple Macintosh introduced in January 1984. With these machines, Apple provided WIMP (Windows, Icons, Mice, Pointers) and features like folders, long names etc which, in the PC world, were not fully implemented till Windows 95. To put it simply, when Windows 95 was released, the reaction of Apple users was "But we had all that 10 years ago". So why did the world wait for Windows 95? The Alto machines were more of a technological demonstration than a commercial venture. They were the path breakers that defined the future on computing, but were unfortunately not commercial successes. Apple suffered from different problems. Apple was a vertically integrated computer company. This meant that Apple made its own architecture, built its own computers, developed its own OS and wrote its own applications. Also, Apple did not operate with any other system. In an industry that was rapidly moving towards commoditization, Apple was a very costly lock-in. Commercial interests took a back-seat at Apple, while it chose to be the cult, the renegade and paid its price. Apple never could pose a challenge to Microsoft, because they never met on the same playground. Apple played on its own hardware, in its own niche, while the huge IBM playground, was left to Microsoft alone. These were, however, not the only products that could have challenged Windows. Quite a few other products provided graphical operating systems, or graphical shells on top of DOS to run multitasked DOS applications which the native OS had failed to provide. VisiOn from VisiCorp, which came on the heels of VisiCalc - the ground breaking DOS spread sheet program, failed because it was way too early. The hardware was just not ready for it. Digital Research's GEM (Graphical Environment Manager) could not run DOS applications. Quarterdeck Office Systems' DESQview, succeeded for a limited time, till Windows 3.0 became the standard. It was not just technology and timing that bogged down Microsoft's competition. IBM suffered from short sight. It felt that the GUI was just a passing phase. Top View from IBM was introduced in 85 and discontinued in 87. Windows 1.0, when it was released 1985, was so similar to Apple Macintosh, that the latter threatened to sue Microsoft. In an ingenious move, Microsoft signed a licensing agreement with Apple that stated Microsoft would not employ Apple technology in Windows 1.0, but made no such agreement for further versions of Windows. However, Windows 1.0's dismal failure at the market made it ridiculous for Apple to follow up with litigation. Windows failure however did not hurt Microsoft as it would have hurt other companies. Because, Microsoft had DOS - its revenue source to fund more and more development on the Windows platform, something that no other company could frankly afford. Version after version, Microsoft bunged Windows, but MS DOS gave them enough revenue to keep at it. By the time Windows became as good as most of the products mentioned here, competition was dead. Curiously, by the time Windows was finally ready, so were the application developers and so was Intel's hardware. When Windows for WorkGroups (Windows 3.1) was released, it was singularly user friendly, had a large set of third party applications to choose from, and had hardware to keep up with demands of a graphical interface. For the first time PCs with Windows were outselling the Mac and Apple could do nothing about it. Impelled by the popularity of its own Word and Excel, Windows rode the craze for the GUI driven PC, guided by the able hands of the future of Microsoft - the incredible marketing machine. Unlike the old world monopolies of the likes of AT&T, technical superiority was never a hallmark of Microsoft's success. And therein lies the reason for Microsoft being the way it is. Monopolies are always a bad idea. They exist by making the cost of entry into a business very high. Microsoft is a monopoly in the PC OS and Office applications segment. Like other monopolies, like say the AT&T, Microsoft tends to spend time defending its position rather than innovating. A monopoly works to raise, the rather high barrier to entry, even higher. As a result innovation suffers. And when innovation suffers at a company like Microsoft, which is producing Operating Systems, everyone suffers. The first alarming effect of Microsoft as a monopoly is due the fact that it writes Operating Systems. Writing an Operating System is a thankless job. An Operating System, is the base that runs user application programs. Since it is just above the hardware, there is only so much the OS can do. And consequently there is very little innovation that you can do with an Operating System. Writing an Operating System, making it proprietary, and making people pay for it, is therefore an unsustainable business proposition. Hence Microsoft does what it is doing - bundle in software and gain unfair advantages in application space. Bundle in Internet Explorer, Outlook Express, Windows Media Player. Tweak Windows to run Office components better than competitor products. Not disclose all Windows API information to third party software developers. All these practices are not only anti-competitive, but directly effect the end users in a number of ways. The second reason why Microsoft's position is a dangerous one is the fact that Windows has been developed rather than designed. Microsoft has put backward-compatibility ahead of other technical considerations. While this might be a good thing in the short run lets understand why this is deadly in the long run. Writing an Operating System is based on certain standards. Unix-like OSes are built standards like the POSIX. These standards define the basis for building an OS. So POSIX based Operating Systems have a designed strength and capacity for security, performance and architecture. Windows on the other hand developed. Windows from 1 through 98 ran as a shell on top of DOS. In effect, it extended capabilities provided by DOS. Hence the security model, and file system etc offered by Windows were limited by the underlying DOS. Windows recognized this early, and started another thread of development called the NT (New Technology). The Windows NT 4.0 was a major commercial success. After Windows 98, both development trees were merged into the first venerable Windows 2000. Windows XP followed shortly after. You will notice that all through, there was no significant break with the past. Never was there a chance for Microsoft to correct the errors of the early QDOS and start afresh. Never could Microsoft, address issues that were inherent to its offering. In effect, its mantra of backward-compatibility became its own choke-hold. Windows and Microsoft has preempted any questioning by its customers by doling out goodies. Extreme simplification, integration and ease of use. This is a third reason to be really scared. Technologies like OLE and ActiveX have been polished and pushed repeatedly. Drag & drop have been used to woo customers. Windows Sharing has replaced the FTP. Windows has challenged, without reason, the traditional knowledge that Operating Systems have to be different from Applications by creating a huge monolithic OS/App. While this has brought computing to the masses, this has also created a technological Chernobyl waiting to happen. In 1983, Fred Cohen, working for his PhD, the in University of Southern California, created the concept of a "self-replicating" program. By 1987, a virus was a known term. 1988, changed all that with the Jerusalem virus, which started making serious trouble. And the trouble did not stop. Leheigh, Tequila, the Dark Avenger Mutation Engine, the Virus Creation Laboratory, Word Concept, Chernobyl, Melissa, ILoveYou, Nimda, Sircam, CodeRed, Klez, BugBear, Slammer and Mydoom represent the woes of the PC world. Symantec became a household name. An email attachment became a bad-word. Simplification, tight integration, backward compatibility and Windows success have created this extremely intolerant monoculture. There is more. Windows owes its success to the fact that it embraced an open hardware platform (Intel) unlike Apple that bet itself on proprietary hardware. Now it is doing the same thing with Applications and Operating Systems. It is creating customers by locking them into its Operating System and refusing to inter-operate with other OSes. What Apple did with hardware, Microsoft is doing with its OS. This lack of interoperability today could well be its Achilles heel tomorrow. One other effect of this lock in, is raising costs for the users. It is no longer possible to get Windows without paying for IE and WMP. This is not only reducing options, but also making the OS an expensive proposition. And when Windows comes with all its bells and whistles, hardware costs are correspondingly rising to provide the horse power, which the user never needs. A home user, using the computer for email only, cannot upgrade from Windows 98 to 2000, without paying for a doubly costly hardware upgrade. In short, end-user costs are rising. It is not as if Microsoft is unaware of this. It is, and its actions are directed by this awareness. Microsoft wants to move away from the OS market into anything else - Xbox, handhelds, Application Software and what not. And each foray of Microsoft is ruthless bordering on the illegal. The browser wars were the beginning. The war against Java was yet another. The war of Windows Media Player with the likes of Real is just heating up, and will not be the last. With Microsoft's cash pile, funding these wars, and given its strangle hold on the computer world, these wars are almost a no-contest for Microsoft. But for the fact that many of the tactics used by Microsoft seriously challenge the antitrust regulators. If Microsoft escaped the US regulators, the EU regulators might yet prove to be a different breed. Microsoft is not on the leading edge of technology. It however is an awesome marketing team. And right now, it seems invincible. And Microsoft depends on this idea of invincibility for its survival. Its stock price depends on this aura. Microsoft's high valuations are due to the very high valuations of its shares. And this stock price can be held only if Microsoft can prove year after year, that it is growing at a breakneck speed. Does not matter what technology it develops or what markets it enters - its growth is the biggest asset it has as of today. The moment, its investors realize that Microsoft cannot grow the way it has been growing, all hell will break loose. The stock price will drop, initiating a spiral downwards. Microsoft must not seem vincible. Almost anything that Microsoft thinks is with regard to the upkeep of this image of invincibility. This is in short the philosophy of Microsoft. This philosophy is brought forward in some measure of sickening clarity in what are known as the Halloween documents. The body of the Halloween Document is an internal strategy memorandum on Microsoft's possible responses to the Linux/Open Source phenomenon. This was meant to be an internal study, but was leaked out at the time of Halloween 1998. The document itself is a fascinating read. Two comments made in the copy of the document over at the opensource.org are very revealing. I will represent the same here, without reference to the context here. The reader need not accept the same at face value but may want to check out the actual context in the document and see the validity of the statements for himself. The first talks about the perception focus of Microsoft the 'technology company'. Note the clever distinction here (which Eric missed in his analysis). "customer's eyes" (in Microsoft's own words) rather than any real code quality. In other words, to Microsoft and the software market in general, a software product has "commercial quality" if it has the "look and feel" of commercial software products. A product has commercial quality code if and only if there is a public perception that it is made with commercial quality code. This means that MS will take seriously any product that has an appealing, commercial-looking appearance because MS assumes -- rightly so -- that this is what the typical, uninformed consumer uses as the judgment benchmark for what is "good code". The difference here is, in every release cycle Microsoft always listens to its most ignorant customers. This is the key to dumbing down each release cycle of software for further assaulting the non-PC population. Linux and OS/2 developers, OTOH, tend to listen to their smartest customers. This necessarily limits the initial appeal of the operating system, while enhancing its long-term benefits. Perhaps only a monopolist like Microsoft could get away with selling worse products each generation -- products focused so narrowly on the least-technical member of the consumer base that they necessarily sacrifice technical excellence. Linux and OS/2 tend to appeal to the customer who knows greatness when he or she sees it.The good that Microsoft does in bringing computers to the non-users is outdone by the curse they bring upon the experienced users, because their monopoly position tends to force everyone toward the lowest-common-denominator, not just the new users. Note: This means that Microsoft does the ``heavy lifting'' of expanding the overall PC marketplace. The great fear at Microsoft is that somebody will come behind them and make products that not only are more reliable, faster, and more secure, but are also easy to use, fun, and make people more productive. That would mean that Microsoft had merely served as a pioneer and taken all the arrows in the back, while we who have better products become a second wave to homestead on Microsoft's tamed territory. Well, sounds like a good idea to me. The effect of the Microsoft monopoly and a glimpse into its philosophy are well brought out in the two quote above. This is by no means a comprehensive outburst on Microsoft. However a number of idea picked up over a period of time have found their way into this article. Many thanks to all those hordes out there, who helped me give shape to and drape in logic the vague ideas that I felt from time to time. We have a lot to thank Microsoft for. Though it might not be for bringing computing to the masses, but it was for a simplification and a dumbing down of technology that was long overdue. But the large scale dumbing down itself has become the curse that we have to deal with today. Microsoft is a giant and at the same time a kid. It is a giant with its market control, its product usage but it is a kid with its tantrums and its desperate philosophy. It is like a kid with a gun, and I don't trust them one bit. February 26, 2004: Essential rewrite of article stressing the central idea and new links too. April 01, 2009: Updates and corrections.